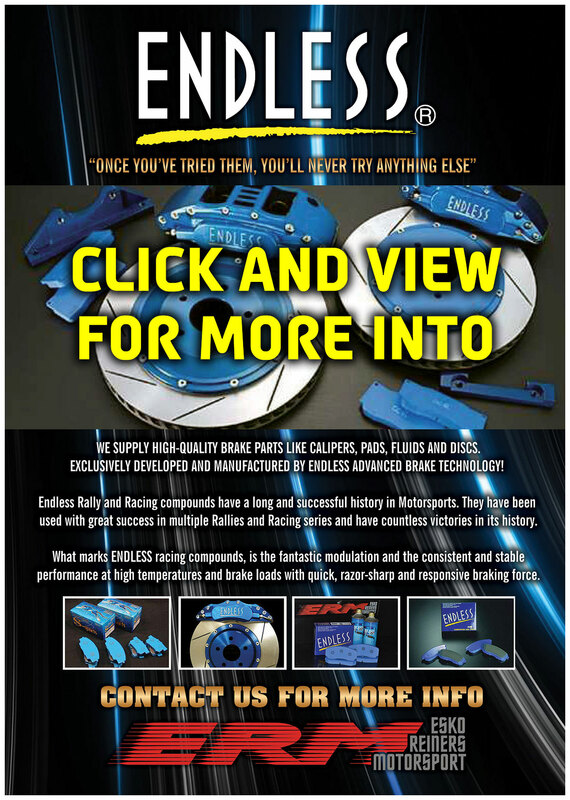 WE SUPPLY HIGH QUALITY BRAKE PARTS LIKE CALIPERS, PADS, FLUIDS AND DISCS, EXCLUSIVELY DEVELOPED AND MANUFACTURED BY ENDLESS ADVANCED BRAKE TECHNOLOGY! Endless Rally and Racing compounds have a long and successful history in Motorsports. They have been used with great success in multiple Rallys and Racing series and has countless victory's in its history. What marks Endless racing compounds is the fantastic modulation and the consistent and stable performance at high temperatures and brake loads with quick, razors sharp and responsive braking force. Popular in WRC, FIA GT, PWRC, International Rally, and various One-Make races. No other motorsport places higher demands on materials than rally driving. A team’s success depends upon how well the driver and co-driver work together. Their interaction with one another needs to be seamless as they chase down every hundredths of a second. Yet their efforts are weakened unless they rely on the right materials. We can provide your rally team with not only great brakes, but also excellent technical support. As a rally drivers, we know that there is much to do, and it is not always the easiest thing to know what brake pads you should use, that is why we offer all our customers technical support. We have extensive experience in motorsports and has helped countless teams to achieve the perfect brake balance. The FIA GT championship is a sports car racing series in which super sports cars, that are based on production road car designs, take on one another. Endless is very popular within GT racing because of the fast and even response in our brake pads. What you will notice when you first try an Endless pad is the incredible feeling you get in the brake pedal, the modulation is great, and the bite is constant and not sensitive to temperature. Our brake pads will give you full stopping power from the first curve till the last, and you will have the same great feeling the entire race. Braking has never been easier, you do not need to heat the pad to get maximum stopping power, and you will be able to trust your brakes. Your mental limit before braking will be significantly improved when you know you can trust your brakes to 100%. When it comes to 24-hour races, endurance is crucial as drivers try to cover as much distance as possible within a defined time period, what we can offer for 24-hour racing is a reliable brake pad with minimal pad wear. Endless is dominating the 24-Hour scene, in the 2011 24-hour Nürburgring positions 1-5 used Endless brake pads, one month later the same result was notice at SPA 24H, place 1-5 used Endless pads. It is not surprising that more teams choose Endless as a supplier. We have fast delivery times, we are available almost around the clock, we have technical expertise across the whole of Europe and not least you get a product that is superior on the market. The advantages are many, not just purely logistic but also technically. The compound that is most popular within the 24-hour racing is our compound ES88G, with ES88G we have managed to combine the best of two worlds, you will have an amazingly low pad wear, but ES88G behave like a sprint compound. It will give you the most amazing initial bite from start to finish and still have a unmatched modulation, ES88G is also very gentle towards the discs. Rally Raid is one of the most demanding motorsports there is, especially on the components. From hot to cold, from wet to dry, from sand to grass, well you name it. And this is obviously hard on the brakes. Endless can off er brake pad compounds that will work flawless under all the above circumstances, and will keep on doing that mile after mile. You will experience a great modulation and will drive with ease over different types of grounds. Endless is the official brake pad supplier and technical partner for BMW X-Raid team. Erm.fi @ 2010-2018 Esko Reiners Motorsport Oy. Webdesign MediaGuru Jack Bacon.